At MV GATE, we have made family engagement a cornerstone of our work in K-5 coding education, most notably via the breakthrough event “Family Code Night.” Featured on both the White House website and the front page of the New York Times, Family Code Night is a delightful, free, whole-school family event in which children pair up with their parent or guardian to do their first hour of coding, together. The effect is dramatic: participants love it (read unedited evaluation comments, below), turnout is remarkable (100+, even in small schools), and families emerge eager for more (literally 100% of evaluation survey respondents to our first Night asked for follow-up classes and programs). Using online learning content from Code.org, MIT, and Google's Made With Code, Family Code Night is easy to put on and a delightful experience for everyone involved. To put on a Family Code Night at your school, get in touch, or click the blue button at right. We'll be happy to help. And as you can see in the comments below, kids and parents love it! "Loved it. Great introduction to coding. Well organized, clear teaching, and helpful coaches." "Loved it. Great intro to my 11 year old. Was a good balance of motivational / inspirational vs hands on messaging and activity. And balance of teaching with simple yet challenging tasks." "My daughter and I enjoyed learning to code!" "Loved it. Been trying to get my girls into coding for years. They think coding is gaming...not necessarily! Was a terrific intro! Thank you!" "Great event, it was fairly small, so everyone had time to ask questions and finish the exercises." "My daughter loved it. She enjoys the Hour of Code mazes." "It was good. My 9 year old was able to finish the 20 puzzles and felt a sense of accomplishment." "Awesome. It was a great change to connect with my daughters and they had a blast. My oldest daughter is 7 and did code kids this fall, but my youngest daughter is 5 and this was her first experience. She loved it!" "Great introduction. Well organized. Appreciate take home sheet with website to continue working at home"
"It was informative, and simple to follow. It had the right level of guidance. I liked it." "Loved it. Kids had a great time." "Thought it was a great intro!" "Loved it! Very informative and engaging." "My 6 year old and I had a fun time. He is excited to do more." "It was great! Well organized and my son had a ball." "It was great. Fun, engaging way to learn what coding is." "we enjoyed it, it was a good way to teach some basic skills in an environment besides home, things are much more difficult to teach at home." "I loved it! My daughter did, too. It was well structured, and it was a fun way for parent & child to learn together." "we liked it. not sure it was entirely necessary to go to the Edna to do it but wasn't a huge imposition." "I loved it. Why? Because I helped run it." "I liked it. It was organized as a fun event with enough build up to excite the kids. The tools to participate were clear and instructions easy to follow. The activity was appropriate for my kid." "Was great.....introduced my daughter to the concepts of code in an interesting way." "I thought it was great. My daughter and I had a good time and are Planning to continue our work this weekend." "We loved it and appreciate the opportunity to expose our son to technology. He could not wait to get home from school today to pick up where he left off last night." "Loved it. Very good turn out and good information. Plus it included engaging tutorials that my daughter found very fascinating." "Very good. It looked like a good set of examples of structural thought. Pattern recognition and I could see where it was going." "We loved it. Both of our girls had fun." "I came with my 6 year old son, who is in First Grade. Overall we had a very positive experience, and I appreciate that this is even offered, as I think these skills are as imperative to this generation as common core, etc." "Great! My 1st grader had a hard time last year at Hour of Code, but really enjoyed Fun with Computers last night." "It was great! Loved workig w my kid and seeing her learn something new. Thought the program was interesting for us both and lots of fun too." "Loved it! the kids were engaged and got an idea of what goes into programming." "It was great. Perfect amount of time and pace"
"Enjoyed it very much, and amazing to see kids master the basics of programming without the burden of syntax." "I thought it was great as a first exposure to programming. May be advanced for kindergartners, but I am excited to show my kindergartner and see how he does (I brought only my 2nd grader but see that it was advertised to all grades). A great beginning." "I enjoyed it very much because the last time I did any type of coding, it was Basic. It was fun to see my son proceed so quickly through the various puzzles and move beyond the first 20." "Great intro to my fourth grader. Also like that they can continue with other puzzles on mvgate website." "An amazing event that allows kids to see Computers as a tool and not just as an entertainment device." "Enlightening experience for both my daughter and myself." "I thought the presentation of the material was very good, and the way that coding principles were introduced was well structured and easy to understand." "Loved it - was such an easy way to get my son hooked on learning about computer programing / coding. Videos were great (although my son had NO idea who those people were! I appreciated it!) The game was simple - so much so my son thought he was just playing a game and didn't realize he was actually coding!" "It was fun and engaging for my third grade son!" "Very welcoming and accessible considering the amount of participants. Nice to see Mrs. Zimmer [principal] supporting the event!" "Lots of fun, easy to learn and an important introduction to computer coding for everyone." "Loved it. Very interesting and simple. The programs design kept my son and I interested for the hour with it simple build up and quick puzzles." "I thought it was great. It was fun and engaging for the kids. I liked the game-like format." "In one hour you really caught my daughters attention. She was able to finish the tasks/games, learn something, and came home with a bunch of questions about programming." "Enjoyed it, my daughter enjoyed it as well. Opportunity to do 1 on 1 with my kid and learn more about how computers work." "Great event. My daughter was thoroughly enjoying herself. I like to see her enjoy problem solving. Its nice that no one is pretending that this isn't the future for our kids." "I thought it was really fantastic. Introduction to the concepts of code using games they know and like made it fun. They want to do it again at home." "I loved it because it engaged my kid at his level doing something he loves (being on a computer) using an icon he knows (Angry birds) to actually learn something he can use the rest of his life, all while having fun and being around other kids. I also liked using experienced kids to mentor/coach the newer kids, all great from a learning, psychology, community point of view. The best program I've seen in my four years in MVSD." "Amazing! The community getting together for Comp Sci was heartening." "It exposed our kids to coding in a fun and non threading environment. The secession was well planned and organized. My son had a great 1st experience. We now need to have a follow up session to keep the connection and interest." "Great event. Hour of fun learning. Program was very effective in teaching foundational concepts." 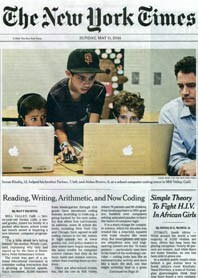 "So great for my boys -- who love screen time and do computer stuff and are VERY computer literate -- to actually understand a bit more about what it takes to create their own things. It's a strength for our family so my son finished very quickly and was VERY interested in the continuing online component at home. Well done!" "Thought it was a wonderful introduction to some of the logic behind code writing. My son was so into it! I think he would have kept going for hours if you let him!" "We had so much fun"
"I liked bringing everyone together to share in this national event. I think the kids need this kind of exposure. Screen time should be a time for them to be engaged in creative effort, not just mindless gaming." "I loved the children working together to solve problems. The rooms were quiet, kids were engaged, and when they completed their "challenge" they felt a real sense of accomplishment." "Loved it. I was so excited to my daughters introduced to how computers work. It was a fun way to do it, too."